19th December 2015, was the Australian Shipping Industry’s night of nights, as the industry celebrated the achievers and accomplishments of the Australian maritime industry in 2015. 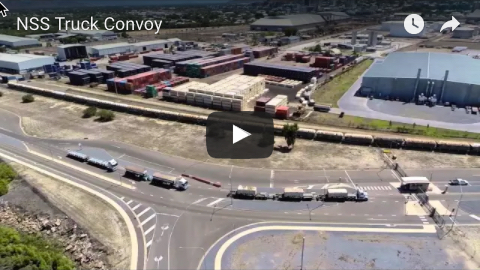 The Environmental Transport award was presented to Northern Stevedoring Services (“NSS”) for its State-of-the-art bulk handling facility, situated in the Port of Townsville. The facility with a multitude of features which sets it apart from other bulk warehousing facilities. 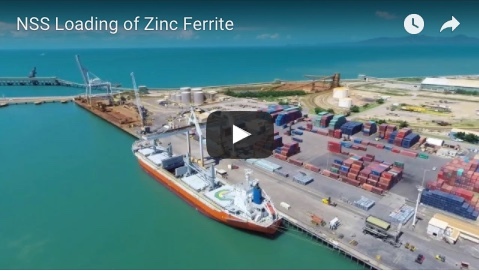 In 2013, NSS identified the need to provide a bulk materials storage facility for a major client in the Port of Townsville. Ferrite produced at the SMC refinery in the neighbouring town of Stuart was to be transported to the facility by road, received and stored prior to vessel arrival. The product was then to be loaded to half height containers to be transported to the wharf and loaded using the award winning Rotabox© loading system. To achieve this, as well as provide product segregation and versatility to hold various products, the 8500m2 bulk facility was divided into two sides. Further segregation is achieved for smaller parcels of differing products using concrete barriers. This allows NSS to store multiple products, however it also meant that the design needed to be versatile enough to meet the most stringent of environmental conditions. Operating in the Townsville port precinct, the proximity of the local community of South Townsville was of primary concern. Dust control needed to be of utmost importance. In addition, the collection of waste materials and ensuring storm water drainage would not compromise the delicate local marine ecosystems as well as the Great Barrier Reef Marine Park, was paramount. The facility contains two stack release points, and are installed post a filtration unit used to remove contaminants such as dust from the air prior to release to the atmosphere. The air is extracted out of the bulk storage facility, thereby maintaining the building under negative pressure to prevent possible fugitive dust releases. The automated doors operate on electronic sensors to ensure that they are only opened to assist traffic entry and exit, this ensures that the optimal negative pressure is maintained. A dust filtration system is located outside the building which provides five (5) air changes per hour. The shed air is filtered through a filtration system that has 48 filters, filtering air to 0.5 microns. These filters receive a blast of air every 1 minute in a cyclical pattern in order to remove product that has built-up on the filters. The dust that is collected from the filters drops to a collection bin. This reclaimed product is then returned to the stockpile. The system is self-monitoring. Any faults such as dust removal system failures or air system pressure decline sends an electronic SMS message to operational personnel. Any breakdowns of significance will trigger an automatic shutdown, ensuring no dust is released while waiting for technicians to arrive. NSS has installed high wind-rated Rapid Doors on Truck Entry and Exit. The doors work in unison with the negative pressure and dust filtration systems to ensure ultimate control of dust emissions from the facility. The Bulk Handling Shed is service by two (2) Automatic Truck Wash Systems. These systems are designed to wash the external surfaces of the trailer/s including the wheels of the prime movers and trailers. Both wash systems have strategically located manifolds & nozzles to maximise the wash down effect where the heaviest deposits occur during tipping ie. wheel spray guards and other horizontal surfaces. The Wash Facility operates using two pumps. The system washes the tyres, sides, front and back of any truck, trailer or container moving through the bays. The system delivers approximately 1,200 litres of water a minute at 7-8 Bar. The water used in the truck wash system, is captured from large roof span and filtered into two holding tanks. The water continues to be recycled until contamination levels need it to be disposed of. Under these circumstances the water is pumped out into road transport tankers and taken back to the client for re-cycling through their reclamation ponds. NSS has also recently installed a 100kW Solar Power system, consisting of 384 solar panels. The power generation is a massive 484kWh per day, or 175,200kWh per year. The potential savings to NSS is in the order of $60,000 per annum, giving NSS a payback period of three (3) years. This clearly shows that energy saving technology has a direct positive impact to business’ profitability as well as reducing the load on grid power. Northern Stevedoring Services has a long and proud history in regional Queensland, and the construction of this purpose built bulk materials handling facility has ushered in a new stage in the company’s strategy – to be a leader in the development and implementation of clean, dust free and energy efficient stevedoring and logistics operation. With this award, NSS has been recognised as being at the forefront of environmental best practice for bulk materials handling.